So easy, yet it seems Facebook has only just bothered to take advantage of no-longer-new standard. A few months back I joined the growing group of people who have uninstalled the Facebook app to extend battery life, limit memory hogging, and shoo off a bit of Mark Zuckerberg’s spying. The m.facebook.com website is very similar to the app in functionality and responsiveness, but one jarring difference has, until now, been the browser interface. 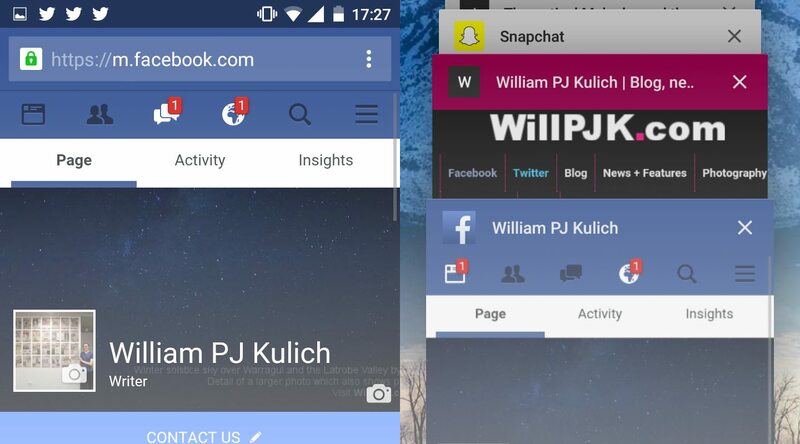 Facebook now colours the browser and Andriod interfaces with its trademark blue, hiding the usual white and black. 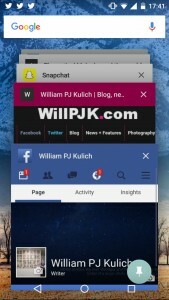 In recent versions of Andriod, the meta tag also sets the colour of the page title in the app switcher. It’s a tiny change, but does make a difference – especially when you’re looking for that open Facebook tab. Other social media platforms and many websites took advantage of the tag long ago, so the reluctance of one of the biggest sites in the world to blend in is surprising. Maybe Facebook was attempting to discourage those who could use the app from using mobile web. Update (00:50, 20160215): A further thought is a recent Chrome update has changed the interpretation of Facebook’s code – there are other ways of setting a website’s browser stylings and maybe Chrome has supported something already built into Facebook. Or my phone has simply stuffed up. Let me know! Comment below if you think this post was a waste of time.